Oaxaca de Juárez (Oaxaca), Mexico - Aldama 303 Y 307 Col. Centro Historico Oaxaca, Oax. 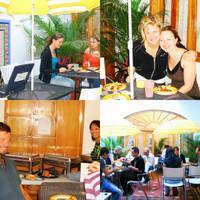 Are you looking for a Hostel located near the zocalo, good, clean, beautiful, comfortable, cheap and also with breakfast included?. Well stop looking because we have exactly what you want and need!. Welcome to Oaxaca. We are exactly in the center of the traditional atmosphere and traditional people from Oaxaca. Take this unique and wonderful experience and spend it with us. 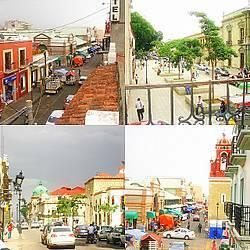 We are in the middle of the markets and folk craft, just two blocks away from the Zocalo Plaza and the Historic buildings of Oaxaca . Enjoy the cultural attractions such as the ruins which are located in Mitla and Monte Alban, galleries, museums, Arts & Crafts markets, traditional oaxacas food, and the beautiful people living in this enviroment. 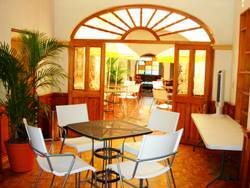 Hostal del Mercado* Youth Hostel in Oaxaca, is a new and comfortable hostel with only 40 beds in 6 large rooms, 6 full bathrooms, beds equipped with orthopedic mattresses, secure lockers capable of storing large backpacks , ceiling fans. We offer a full free breakfast (tropical fruit, cereals, sweet bread and toast, cakes, orange or apple juice, milk, coffee, tea, bagel, pan cakes, yougurt, butter, jelly jam, ham & eggs(to your liking), traditional chilaquiles, tamales from the market, and beans etc.) included in the price of purchasing a bed, we have a different menu every day, is available from 12 to 24 pm opened kitchen for the guests. We have a dining area, two interior backyards for smoking, we have a beautiful balcony with a amazing view of the street showing the market and the people. 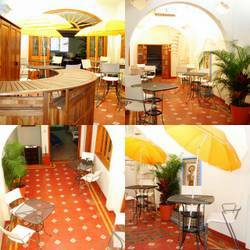 We have recreational room where you can relax, we have a pool table, table games(chess, cards, domino etc. ), wireless internet, t. v. with cable included, and a guitar, comfortable resting chairs and sofas. In the Hostel we have a backyard and we may accept up to medium-sized pets with certain restrictions. We would love to accommodate you on your stay(or visit) in Oaxaca. We have English and Chinese speaking people. 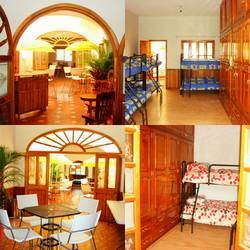 We welcome you to stay in our hostel. if we vacancy you can check in. Bedrooms female and mixed, clean and comfortable, equipped with single beds with orthopedic mattress, sheets, mattress, pillow, towels, soap and shampoo, ceiling fans, spacious locker security. Full bathroom in the room and full bathroom shared outside. 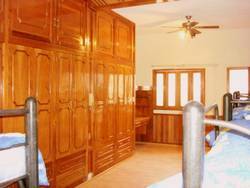 Private rooms with double beds with shared full bathroom outside. International food, tortas tacos etc. Special price per group, higher than 4 people, $ 11.00 U.S. Dollars. There are only two types of transport, Individually and collectively, I recommend its low cost by taking public transport, is usually a 7 passenger van. The walking distance is long, it is not advisable, from the airport to Hostal del Mercado is 5 miles - 8 kms. Among the streets of J. P. Garcia and November 20, at the Dow town of Oaxaca. You can take a taxi on the platform of the terminal, taxi at any time, there are 24 hour service, the taxi has an approximate cost of $ 4 and $ 5 US dlls, = $ 40 or $ 50 pesos, the cost is not a taxi per person, its for one to four people, including luggage, depends on its bargaining, the transfer time is 10 minutes. 30 meters from the corner on November 20 and Aldama No. 307, almost opposite the market is located Hostal del Mercado. Enter by Avenue and International Road, on reaching the roundabout at the Teatro Alvaro Carrillo continue to address the information centro by Calzada Madero who becomes Av. Independence until the of J. P. Garcia street, turn right to find the Aldama street, turn left and get into the wax right at No. 307. Hostal del mercado.